In an exclusive interview with The Education Report, Ape Terhemba Moses, who emerged the highest scorer in the 2018 Unified Tertiary Matriculation Examination (UTME) conducted by the Joint Admissions and Matriculation Board (JAMB) out of 1,653,127 million candidates that sat for the exam. He scored 354 marks and revealed that excellence in life demands hard work, determination to succeed and prayers. The former student of Covenant Christian International College, Makurdi, Benue State disclosed how he became used to putting himself in comfortable positions to fight sleep so he could study all night. In the May/June 2018 West African Senior School Certificate Examination (WASSCE), he obtained: English Language C4, Mathematics A1, Biology B2, Chemistry B3, Physics A1, Civic Education A1, Further Mathematics A1, Geography B3 and Data Processing A1. I am 17 years old from Konshisha Local Government Area of Benue State. I am Tiv by tribe, a Christian and from the family of Mr and Mrs Daniel Ape. My father works in the state High Court while my mum is a university librarian with the Federal University, Lafia. From Basic school, I was never looked upon as a bright student. But it all came to a point in my Basic 5 when my Maths teacher took interest in me and encouraged me to always do my assignments. He instilled fear in me to always do my assignments and if I didn’t do it, I was sure of being punished. In doing that, I discovered that I was improving in Mathematics. And by the time I got to Basic 6, I had improved so well that I was one of the best in the subject in my class. When I entered Junior Secondary School (JSS1), I already had a grasp of most of the things we were being taught. Another thing that really helped me in secondary school was the way my seniors handled me. I was in Glory hostel in JSS 1. And because I was not used to the boarding system, I was always sleeping. But my seniors helped me and I began to read at night. They used to tap me from sleeping if I sleep off or out rightly woke me up from the bed. We developed methods of reading like putting our legs inside water while reading to prevent us from sleeping. Sometimes, I put pillows under my knees so that I would be uncomfortable and fall off if I wanted to sleep. That kept me going. I was also scared that my position that term would not be good enough but to my surprise, I came 5th. I discovered that if I didn’t put in as much efforts as I wanted and I still came 5th, then, I could do better with a little more effort. I felt challenged seeing my juniors most of whom were girls coming first in class while I was going home with a 5th position. My parents also played a big role in ensuring that I emerged the best. I was motivated further when I entered the senior class where I was exposed to school competitions. The first competition I went was the Olympiad competition. When I got there, I saw my mates from other schools. The questions were tough but I knew they were not insurmountable. I just believed it was the same thing they taught me that they are going to base the questions on. So, I saw no difference. In other competitions I attended too, I discovered that students were trained specifically for those competitions and they go there and do well. I represented my school in NNPC competition and to my surprise, I came 4th in the whole Benue State. I was further challenged because to my standard, I didn’t really prepare for that competition because I was scared. I came back and started revising my SS1and SS2 notes. Another thing that helped me was when I wrote the Nov/Dec 2017 WASSCE in SS2. That really helped me to know my strong and weak points and to work on those weak points while also ensuring I maintained or sustained my strong points. 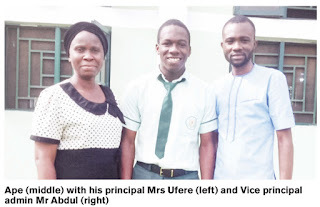 Before the real UTME, he sat for the mock examination and was not happy with the result, he scored 298. I was not happy with the score because last year’s highest score in the school was 299 and the school was mounting pressure on students to get highesT marks than the previous set. I tried hard but when I went for that mock examination, my result was one point below the highest scorer last year. I set a higher standard for myself because my teachers made me believe that I could do better than that. For instance, during the holidays, one of my teachers met me and told me that I should not look at the past record of the school but I should aim higher. My form teacher also told me same that what the school is jubilating about, other schools are celebrating higher scores than that. That made me to buckle up and read more. When I entered the examination hall I was not confident but I just said, God, please help me because I usually make errors whenever I’m in haste or when I’m being timed or when I’m under tension. Surprisingly, that day after I finished answering all the questions, I had sometime to still go through my work and make necessary corrections. That helped me a lot. I want to become a software programmer. My plan is to gain admission into the University of Lagos to study along that line. They should not wait until they get to a certain stage before trying to make a positive difference. It is never too early to begin to make a difference. Whether they are in Basic six, JSS 1, SS 11, SS111 or preparing to write external examinations, they can still performance well, they have all it takes to excel. I want them to know that everybody has potentials to make it in life. Just put in your best and leave the rest to God.